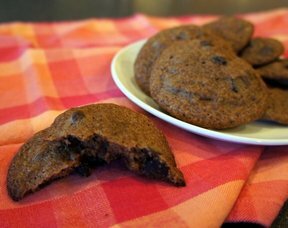 A touch of chocolate tops off these crisp peanut butter cookies. 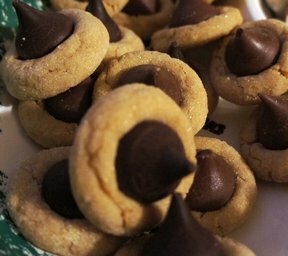 These are a tradition in most homes around the holidays but should be made year round! Preheat the oven to 375ÂºF. In a large bowl, mix the shortening and the peanut butter. Add the sugar and brown sugar, and mix until light and fluffy. Add the egg, milk, and vanilla; beat well. In a different bowl, combine the flour, baking soda, and salt. Add this dry mixture to the creamed mixture. Shape the dough into 1-inch balls, roll in sugar, and place on an ungreased cookie sheet. 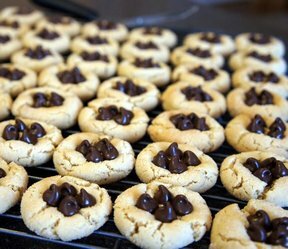 Bake 10-12 minutes; then immediately place chocolate pieces on top of each cookie and press down. Cool and serve. "My favorite cookie! 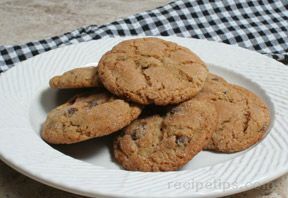 Baked these yesterday for an after school treat."